digging up the dirt: Birdy pests? This morning I have some time to relax (love days off). So I decided to chop a pile of fruit for breakfast and though how good blueberries would go. They have quite a good crop which is great considering they were moved into the ground from pots. I was quite concerned about the sandy soils but I am feeding them with 'Kahoona' by the same people who do 'sudden impact for roses'. They seem to supply the correct nutrients for my acid loving blueberries. Anyway I have managed a couple of bowls of tasty blueberries. And my cousins brought their children over on the weekend and they had quite full bellies after they were shown which berries to pick. SO there has been much love for my beautiful blueberry bushes. As you can see mangled blueberries. I strong suspect birds. But why couldn't they eat the whole berry rather than going from one berry to the next squishing them? You will notice they haven't touched the non-ripe ones (thankfully). Why did they have to do this to every single ripe berry??? Cute but destructive! Last time I feed them birds! What a pity. I could forgive culprits as pretty as those though. 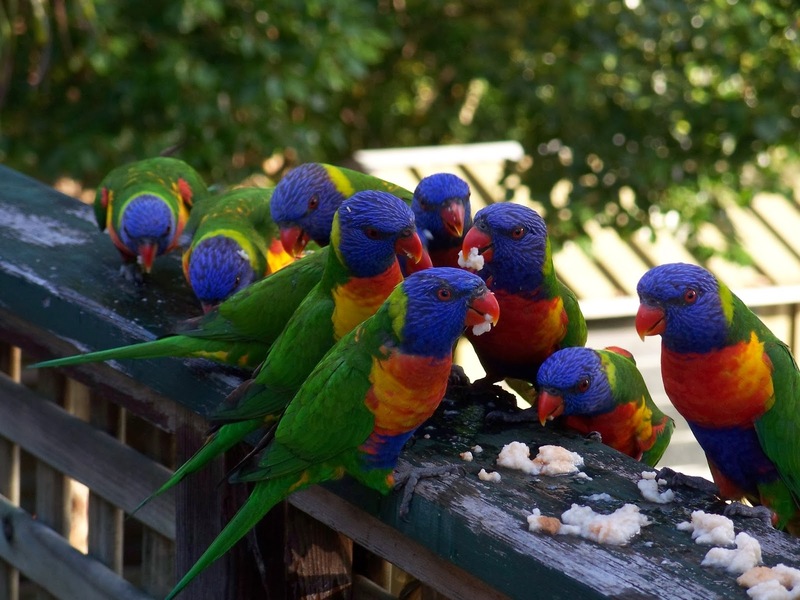 I get rainbow lorikeets eating my figs, but I don't mind as I don't really like figs. Look at those fabulous birds! It's pigeons and sparrows over here - much more modest plumage but equally as destructive. Get the nets out quick to save the rest of your beautiful blueberries. Hi I'm Jen, and live with my husband Mr R, his nephew V and our furry monster Diba in a half falling down weatherboard house in the North of Sydney. I am Horticulturally trained and usually spend more time in other peoples gardens. I hope to show you from time to time some of those gardens and gardens that I happen to come across. However I do really want to get into my garden and hopefully start sorting it out as well.